Bless me Father for I have sinned . . .
I’m addicted to a Sinner. No, I don’t know how it happened. It’s just so out of character father, I don’t know what to do. He’s rough and rowdy. He plays country guitar and loves to party. He has friends like Jack Daniels and Jagermeister. But father . . .
Well, I kinda like him and – well – father, you might too if you’d be a little more open, Father and – um, check him out. Awww, don’t be judgmental, Father, the Mighty One wouldn’t like that. Be open minded. Well yes, Father, I know he’s been to prison – but, Father, I can explain . . .
He’s just a hard working, guitar slinging, country singer who’s up for the Nationwide Insurance “On Your Side” Award for New Best Live Act – and well, he just needs your Vote. Certainly, Father, we don’t turn down those in need. I shall not turn the other cheek, Father. I’m sorry. I’m on a Church Mission, here and I’m asking for your support . . .
Pray for – I mean . . .
Country Music’s Best New Live Act. It’s the Nationwide Insurance On Your Side Award. It’s fan voted. You can vote daily up until June 7th. The winner will be announced on June 8th. Maybe with our support Eric Church will change his ways . . . If a song has Eric Church’s pen, voice and production on it, you KNOW it’s good. I am a HUGE fan of Eric Church. I’ve commented on him winning – um – Best New Solo Artist ??? and I’ve made reference to his current song in a previous post. But now Eric Church has taken his current single “Homeboy” to the Tennessee State Prison for filming – the site where in 2007 he filmed “Lightning” from Sinners Like Me – the best album to come off Music Row in 2006 and the debut of Church’s master lyrical songwriting craftsmanship, production and whiskey-soaked vocals. That alone should tell you the Homeboy video promises to be powerful. Now, personally, I hate when people ruin a song or a movie or a book or even an article for me by telling me all about it and giving their opinion. I like to watch, look and listen and form my own. So . . .
That’s what I invite and urge you to do here, watch, look, listen and f-e-e-l this song, this video, this artist – form YOUR own opinion – then pass it along. If you’re on Facebook you can watch Homeboy right now ! 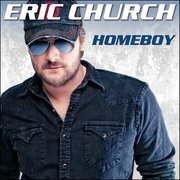 on Eric Church’s bandpage – which is always nice to give the artist a “visit”, a “like”, a “thumbs up”. If you’re not on Facebook, then sign up now or . . .
Head over to the official Eric Church website to watch it there and fill yourself in and up with everything Eric Church – you’ll be glad you dropped in. And please come back and share your thoughts of Eric Church with us here ! We’ve all made mistakes at one point or another in our lives – no? Whether it’s minor or magnanimous doesn’t matter. We’re really not as alone in the process as we might think. But mistakes are journeys down the learning highway and . . .
You can always go HOME – physically, mentally, metaphorically. Have you or someone you know lost their way? Did they find their way back? Could this message perhaps be an inspiration for them? Share this with others who might need some help and share here your stories of mistakes, wanderings, returnings . . . or assistance you’ve given.